When it comes to improving the long-term value of a home, while simultaneously providing enjoyment with the results, look to remodel the bathroom. At ProSource® of Amarillo, you can meet with our kitchen and bath designers to create the layout you want and find the products you need. From start to end, we provide the advice necessary to make the most of your bathroom remodel. 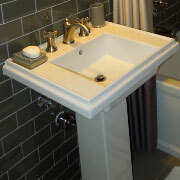 More than just a functional piece, the sink serves as a defining part of the visual appeal of any bathroom. At our showroom, you’ll find sinks made from marble, porcelain, and other materials, in above and under-counter options, and even pedestal. 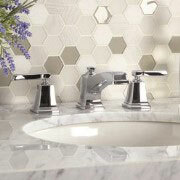 The bathroom faucet can contrast with, or complement, the style of the sink, and the bathroom decor more generally. It’s a functional and fashionable piece that should not be ignored. A variety of choices await at ProSource. At ProSource of Amarillo, you’ll find the products you need to sculpt a shower into a private retreat. Our team will guide you through a collection of doors, heads, handles, and more to make the shower stand out. 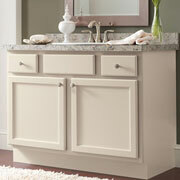 A vanity is an attractive and stylish way to provide valuable storage space for any bathroom remodel. Pair a new vanity with a decorative mirror and a luminous new light fixture, and create a space that is as beautiful as it is practical. 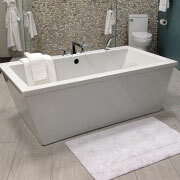 Because of its size, the tub can sometimes overwhelm a bathroom. 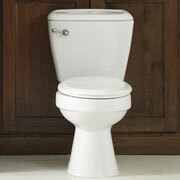 At ProSource, you’ll find a selection of tubs that seamlessly fit into the decor of any bathroom. Choose from materials like marble and fiberglass, and a myriad of options that are sure to delight in any bathroom. This fixture in a bathroom can be found in high style options and materials. For those who are eco-conscious, ask your dedicated account manager about water-efficient models that will save water and money.